Celebrate the beloved upstairs/downstairs world of Downton Abbey by dining like they do with this brilliant collection of inspired recipes and photographs for celebratory teas, themed dinner parties, and pre-movie binges. Re-enter the extraordinary world of Downton Abbey by experiencing the cuisine of both servant and master in this unofficial, expanded cookbook that offers a glimpse into the simple and extravagant meals of the early 20th century. 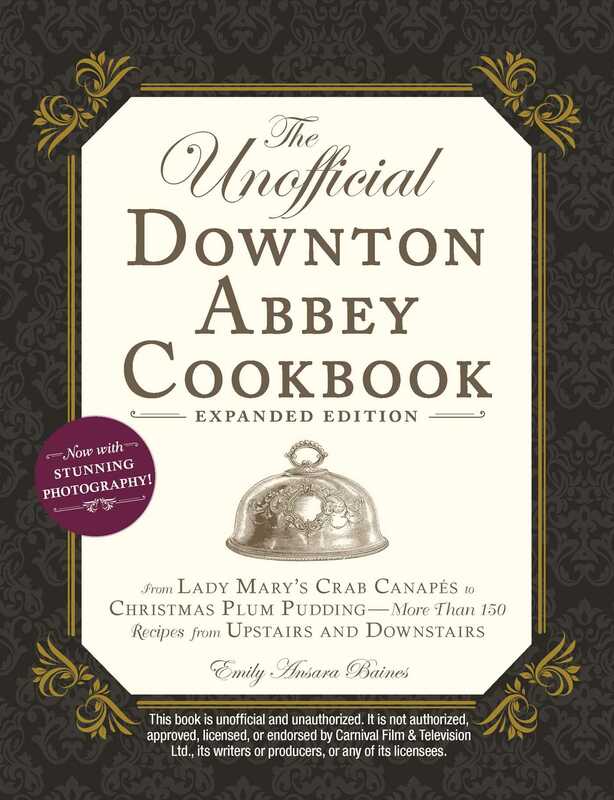 Inspired by food from the award-winning TV series, The Unofficial Downton Abbey Cookbook, Expanded Edition offers over 150 recipes to take you on a journey back in time. Whether you are recreating tea with cucumber sandwiches and berry scones or experiencing a full course dinner with salmon mousse and roasted chicken, this delightful cookbook offers you plenty of ideas for delicious dishes to impress your friends. Feel sophisticated and elegant as you indulge in the decadent menu Emily Ansara Baines, a professional caterer and baker, has prepared for you. Perfect for fans of the show and just in time for the release of the movie, The Unofficial Downton Abbey Cookbook gives you the opportunity to experience Mrs. Patmore’s cooking for yourself by dining like the Earl and Countess of Grantham or seeing what food was like for the maids and butlers in the servant’s quarters. With all the recipes, photographs, and dashes of historical insight, this cookbook is essential to any Downton fan’s collection. Emily Ansara Baines has worked as a professional baker and caterer throughout the East Coast, most recently in New York City. When Emily isn’t busy writing, baking, or trying to learn French, she’s watching her favorite series, Downton Abbey, in hopes of one day being as elegant as the ladies of Downton.